Back in July I wrote about the launch of the Levi's Go Forth campaign. The campaign aimed to reinforce the Levi brand as the original working class hero, the spirit of the original American settler and the revolutionary patriot. The campaign was brought to life through tv, radio and internet. The campaign was developed by Wieden + Kennedy and called on the public to write a new Declaration of the Unites States of American. The tv ad for the campaign featured an original wax recording of Walt Whitman reading his poem “America" overlayed on black and white vignettes. The MP3 of the Whitman's recording is also available for download from the campaign site. The campaign has had a number of iterations in the last three months and has used a host of iconic themes central to the original campaign spirit to maintain the overall campaign through this extended period. However the question still remained up until just a week ago, where could the campaign go next? "The question we asked was how do we bring this ['Go Forth'] idea into the real world and bring the brand's unique history into the story and the challenge," said Doug Sweeny, vp of brand marketing at Levi's. "We're trying to get people engaged in the idea of go forth and make it very active." While the campaign focus to date has very much been around the historic roots of the Levi's brand. However, the modern Levi's customer is very entrenched in a digital world, interacting with everything around them through various digital channels. With this in mind, Levi's needed to draw a clear line between the past and the future. The tool chosen to do this was an Alternative Reality Game that would bring users on a digital treasure hunt through both the real world and the digital worlds that we now occupy. 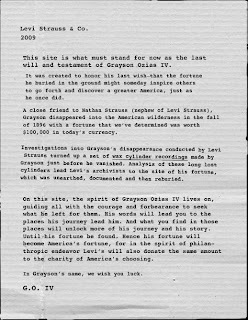 To fully realise the potential of an ARG and to make the experience as emersive as possible, a narrative was created around a character named Grayson Ozias IV. Grayson has left wax cylinder voice recordings hidden across America, and has challenged the public to find them and, ultimately, a $100,000 fortune that he also buried. While the game may be considered in many ways to be a 'diet' version in comparison to some of the more elaborate and complex ARGs that have surfaced in recent years, this is more then made up for with the rich and layered content used to drive game play. People participating in the game are asked to solve online puzzles in combination with real-world tasks. All to hunt down clues that will unlock the next part of the game's story. "We're pulling a page out of the ARG books, but we're trying to keep it a little less complicated," said Levi's director of digital marketing Megan O'Connor. The target audience is Levi's 18 to 24 year old consumers, according to O'Connor. It follows what she calls the "1+9+90 rule" in believing for every full-on participant there will be nine commenters and 90 passive observers, and for that reason, the game's story is accessible to all visitors, not just those playing the game. Levi's have also made the step of expanding into the Social Media environment by posting some clues through the campaign Facebook page. The Page already has nearly 150,000 fans. In conjunction with this the game also uses Twitter. Plans have also been revealed for other social twists; including the use of live streaming service 12seconds. Perhaps most interestingly, however, will be the introduction of a social responsibility element, when Levi's ask participants to choose a charity that will receive a $100,000 donation. Levi's is promoting the game via video banner ads on sites including Facebook, Break and Pandora. Publicis Groupe's Razorfish handled digital media planning and buying. As mentioned above, the Go Forth campaign has seen several iterations over the past three months. This is the third online "excursions" Levi's has planned as part of the "Go Forth" campaign. In "The New Declaration," Levi's challenged people to redefine the Declaration of Independence. Then as the second "excursion" there was a video contest around the concept of "The New Americans." Another three expeditions are planned for the coming months. All activity associated with the ARG has been done by Wieden + Kennedy. Go live was last Monday (5th October) and the game will run until mid-November.